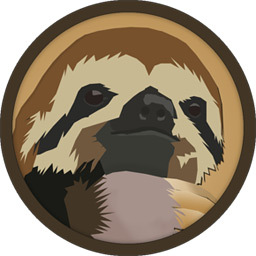 Slothcoin (SLOTH) is a SHA-3 Keccak peer-2-peer cryptocurrency created for having fun and in the mean while revolutionizing currencies. It is based on the idea of Dogecoin and combined with some more advanced aspects like the SHA-3 encryption algorithm, which equals out the difference between Nvidia and AMD graphic cards and is more secure than SHA256-like encryption algorithms. A total amount of 100,000,000,000 coins will be mined in the creation process, ensuring that there are enough coins for everyone and that Slothcoin will not become a comma-currency like Bitcoin. A block-time of 60 seconds ensures fast transactions while in the mean time reducing orphan rates that occur with block-times below 60 seconds. Kimoto’s gravity well is implemented to adjust the difficulty every 4 blocks, this will prevent multipools from taking advantage of low difficulty and ensures that the coin does not get stuck in a high difficulty scenario. And the big question is could this coin follow in the DOGEcoin steps?